Wedding Blog: How Do I Plan A Wedding? Planning a wedding can be one of the most daunting tasks in the life of a bride and groom. The key to success is good planning, organizing, timing and reducing needless anxiety over details and costs. How you start planning your wedding will ultimately determine the results. So don't rush the initial planning process. First and foremost, get your hands on a wedding planning checklist. A good wedding checklist will help you cover the major tasks associated with the wedding as well as the details. Wedding checklists come in a variety of formats including static webpage lists, text documents, PDF documents, spreadsheet and application format. You'll also find printable lists so you can check off items and add notes on paper. Another popular, tried and true format that has been used for ages and is still being used are wedding planning checklists in paperback book format. While there are literally thousands of wedding planning checklists on the Net, a wedding planning checklist should do more than provide a list of the major task and a check box. The right checklist will help you schedule and organize your time, prioritize event planning tasks, point you to associated task worksheets and provide many other vital planning benefits. That's where wedding planning TIMELINE checklists come in. Timeline checklists are designed to help the user get an overview of tasks involved in managing the event from day one to the day of the wedding. Studying the timeline helps the user get an idea of how and when to execute and follow-up on tasks associated with planning, organizing and managing the wedding. A wedding planning timeline checklist helps you get done what's needed in a timely, organized manner and thus save time, money. Such good planning spares you needless anxiety and can help you save thousands of dollars in fees and service costs. A good wedding planning timeline checklist consists of a multi-page checklist, a timeline stretching over several months, tips and associated task worksheets. That said, the ideal timeline checklists are those found in book form. 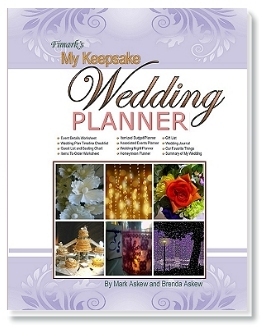 Complete wedding planner with the wedding planning timeline checklist. What's In a Good Wedding Book?